Our work goes all out for holidays and decorates the entire company with contests between departments and all kinds of fun. 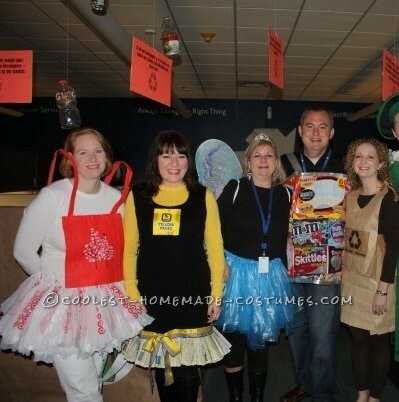 One year when funds were tight, they challenged us to create a “recycled” Halloween. Our department took this literally, so we decided to do a “Recycle” theme. I made costumes for most of our department. We divided everyone up into paper, plastic and aluminum. The picture is a few of the costumes I made. Working from left to right, I will describe each costume. Target bag – by taking strips of Target bags and tying them to a ribbon, I created a skirt of target sacks. I then added a cut-up re-usable Target sack as a shirt to complete the outfit. The Yellow Pages – this one turned out so cute. It was a basic black dress purchased at a thrift store, I then took pages from the yellow pages, folded them up into fans and sewed them onto the bottom of the dress. I added an accent yellow ribbon on top of the phone book skirt and then cut out the Yellow Pages logo and placed it on the top of the dress. The Recycle Fairy – by using strips of blue recycle trash bags, tied around a ribbon, I made a skirt. Paired with some wings, she became the Recycle Fairy. A Wrapper – by fusing candy wrapper bags by ironing them between wax paper I sewed them together to make a vest. This one was a play on words and fun, he wore a Gold Chain and was the implied “Rapper”. Recycled Paper Bag – By using small brown lunch sacks layered one on top of the other, I sewed them together to make a skirt. I then cut up a large paper sack and sewed it together to make a shirt. I then added the Recycle logo from the brown sack to the shirt. Our department decorated the area with facts about recycling, recycled materials, and robots we made from boxes and all recycled items. It was a huge hit and we won an award for being so original.